After the ludicrous space escapades of the underrated Moonraker most people thought it was time for a change in the Bond films. And what a change For Your Eyes Only is. It starts off in a way similar to other Moore era Bond films with a slightly silly moment; Bond’s dispatching of Blofeld. After Bond visits his wife’s grave, which is a nice nod to the past films, Blofeld tries to kill Bond by using a remote control helicopter. To cut a long a long story short, it end’s with Bond dropping the wheelchair bound Blofeld down a smoke stack. It feels similar to when Bond beats up Nick Nack in TMWTGG; in that Bond basically beats up a midget, and in this he’s picking on the disabled. But I suppose in this case it’s revenge for Blofeld killing Bonds wife. Also, the film-makers weren’t even allowed to ‘officially’ call the bald, Persian cat stroking man in the wheelchair Blofeld, due to copyright. Anyway, after this, the film becomes something else entirely, and is more violent and serious than the rest of the series up until this point. The film is about Bond trying to recover a valuable piece of technology belonging to the British government which was lost at sea, and doing do before the villains do. The villains in question are drug smuggler Kristatos played by Julian Glover and the silent but deadly Locque played by Michael Gothard. Kristatos is one of the less extreme villains in the Roger Moore Bond film back catalogue, and is not as a good as previous villain Hugo Drax. He is still good, and the always awesome Glover plays the part well but he is more of a realistic villain, to match the tone of the film. Locque is Kristatos henchman and doesn’t get a single line of dialogue throughout the entire film. Never the less, he is awesome, and extremely evil. He also has one of the best and coldest death scenes at the the hands of Bond in the entire series. The film is also a tale of revenge for Bond girl Melina Havelock played by Carole Bouquet, after her parents are murdered by the evil Kristatos and Locque after they stray to close to the lost technology that Kristatos is trying to retrieve. Melina continues the trend of better Bond girls, and is equal to Bond in every way. In fact, she may even get a higher kill count in this film than Bond himself! Bond is also assisted by Kristatos’ rival smuggler, Milos Columbo played by Topol. He is a really fun addition to the film and I personally wouldn’t have minded him popping up again in a later film to help Bond out. Moore is as good as ever, if you are a fan of his like I am. His one liners are a bit rarer but still mostly hit their mark. By this point Moore was starting to look his age but for now, he can still pull the role of Bond off. The film also contains some brilliant stunts. The finale atop a mountain top monastery is less outlandish than a lot of Bond film finales, and is a truly thrilling and awesome looking finale, especially Bond’s climb up to the monastery. Another particular scene involves Bond and Melina escaping Locques men in Melina’s yellow Citroën 2CV. This scene is really fun and creative, showing that even on the twelfth film, the film-makers can still come up with new things. The particular highlight in the film though, comes halfway through in the Italian Alps at a Skiing resort. The chase is one of the best none car chases in the series and is better even than the awesome skiing scene in OHMSS. This scene also features some awesome music, and the movie as a whole has a really cool, 80’s score. A great theme song by Sheena Easton (who also appears in the opening credits) tops it all off. 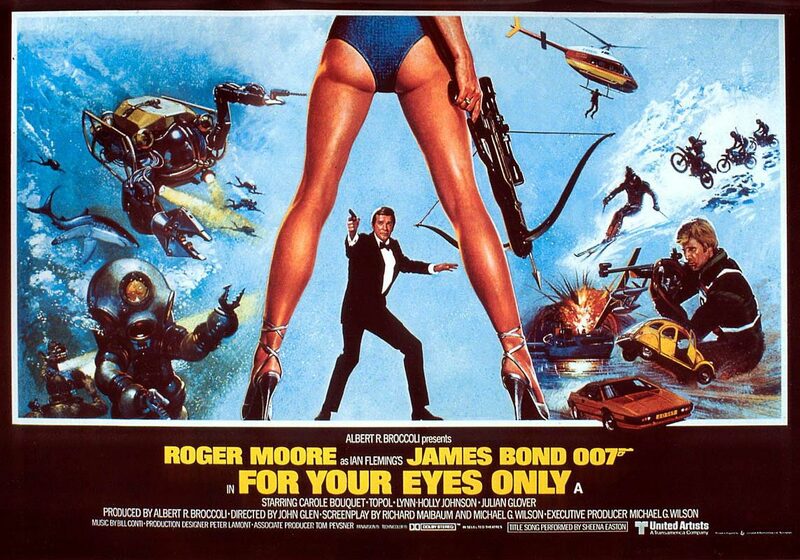 The Bottom Line: For Your Eyes Only is a great and different Bond film. A slightly darker and more serious film than others, but it still has its fun moments. The villains are less campy, and not as good as some others but it all adds to the tone. The action and score are some of the best in the series and shows how Bond could still be awesome in the 80’s. FYEO is a welcome change to the Bond films and is a great first entry by seasoned Bond director John Glen.